Putting together a nursery for a new baby is exciting and time consuming, especially when you are looking for bespoke pieces to decorate your little one’s room. Babyologists, we love to help you save time on your nursery decorating and we have found a lovely wall banner to add personality to your baby’s nursery once they are born. For a truly unique piece of typography, it is very hard to go past this New Baby Wall Banner by Colour and Spice. While there may be other babies out there with the same name as your little one, they aren’t also going to have the same birth details! Each wall banner is designed, hand sewn and individually printed in Australia. Designs are screen printed on thick natural cotton twill fabric. Dowel with rounded edges and natural string is included so it is ready to hang. Each banner measures approximately 33cm by 41cm, not including the string. 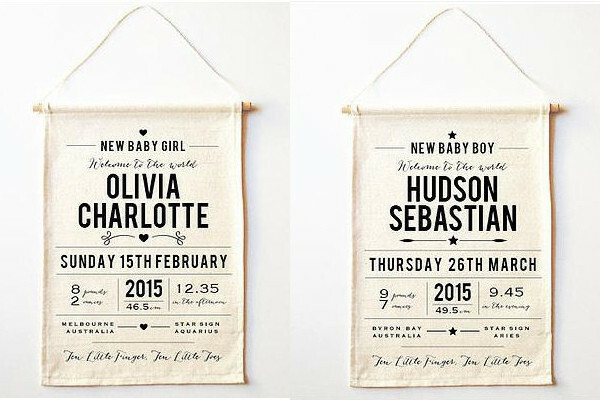 New Baby Wall Banners are available from Not In Shops for $44. As the wall banners are made to order, you will need to allow up to three weeks for it to arrive, so be sure to save that perfect spot on the nursery wall!